High Temperature Industrial Airtorch™ with input up to 600°C and Output up to 900°C. This unit is high power ~40KW. 240V 3 Phase. Heavy. More GTA Models. Click Here. Contact MHI by clicking here. The Airtorch™ is a highly scalable electric process air heater typically utilized as shown in the Airtorch Infographic. 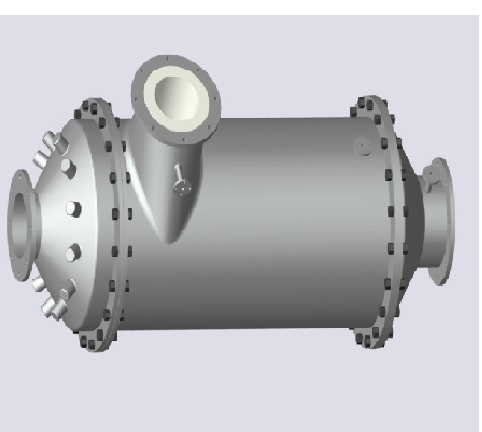 The typical Airtorch model output is up to 1200°C (~2150°F). They offer high flexibility and greater control of your process heaters – room temperature is assumed as 25°C for standard input – HI models allow even a 600°C input . Several models available in each class. Simple 5-step selection guide and flow as a function of temperature for various models. 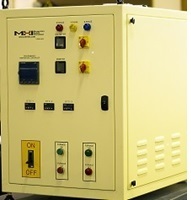 MHI provides models for 750°C, 925°C, 1000°C, 1100°C and 1200°C. Prices increase with power and temperature. Why MHI Airtorch™? Very low pressure-drop, highest-temperatures, high-efficiency, industry leading quality, price and delivery. Pressure drops can cost the user a lot of wasted expenditure. See examples here. 6 Bar pressure rating of shell. You are the Best! Thank you very much for your support. I am very satisfied with the Airtorch™; we operate it everyday between 1100 and 1200°C for our experiments.